The 2015 IFBB Arnold Classic & Arnold Sports Festival are Presented by Classic Productions. Celebrating the 27th Anniversary of the IFBB Arnold Classic and the 9th Arnold Amateur Championships. 5-7 March 2015, Columbus, Ohio, USA. Held at the Greater Columbus Convention Center – Expo stage and Battelle Grand. The Presenting Sponsor was Gaspari Nutrition. See all of the lineups, key comparisons and callouts plus posing by the top 5 competitors in each bodybuilding class, and all awards and OVERALL POSEDOWNS. The classes for each division are shown from prejudging through to their finals, and then on to the next division. The DVD presents the COMPLETE PREJUDGING for all 3 classes - Men's Physique, 212 and Pro Men, with all of the compulsory poses, callouts and comparisons. The FINALS include the posing routines, comparisons, posedowns and awards plus Cyr DB Lift. Congratulations to DEXTER JACKSON of USA for his record 5th victory at this event. 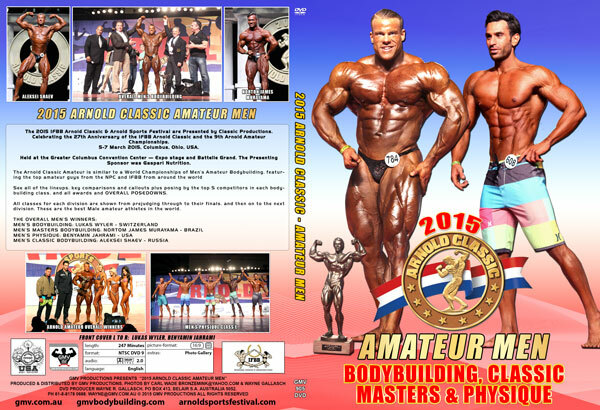 COMPLETE 2015 ARNOLD AMATEUR (USA) RESULTS - MEN & WOMEN. This Women’s DVD #1 of 2 presents all of the classes of the WOMEN'S PHYSIQUE, WOMEN'S BODY FITNESS (FIGURE), WOMEN'S MASTERS BODYFITNESS & ARNOLD MODEL SEARCH. DVD CONTENT: See all of the lineups, key comparisons and callouts plus posing by the top 5 competitors in each class of WOMEN’S PHYSIQUE, and all awards and OVERALL POSEDOWNS. This Women’s DVD #2 of 2 presents all of the classes of the WOMEN’S BIKINI & WOMEN'S FITNESS. DVD CONTENT: See all of the lineups, key comparisons and callouts, and all awards and OVERALLS. The classes for each division are shown from prejudging through to their finals, and then on to the next division. These are the best female amateur athletes in the world. Collins, McDonald & Gann, P.C. To the 2015 IFBB Arnold Classic USA - Pro & Strongman Results.